Replace your timing belt every 50K to 90K miles (check your owners manual for specifics). We'll get your timing belt checked out and replaced as painlessly as possible. Our mechanics will get a good look and listen to your timing belt to make sure that it needs replacement, first. If we have to take important parts of your vehicle off, then we will be considerate enough to offer other preventative fixes while we are in there. It's the right thing to do. The idea behind the timing belt is pretty simple: If it breaks, then it will cost ten times the amount of simply replacing it when recommended. In fact, a broken timing belt could ruin your whole engine, and that will cost thousands of dollars to replace. Timing Belt replacement is a common service that simply NEEDS TO BE DONE, but only every 50,000 to 90,000 miles. It is a labor-intensive procedure, but well worth the cost in preventing a bigger issue. 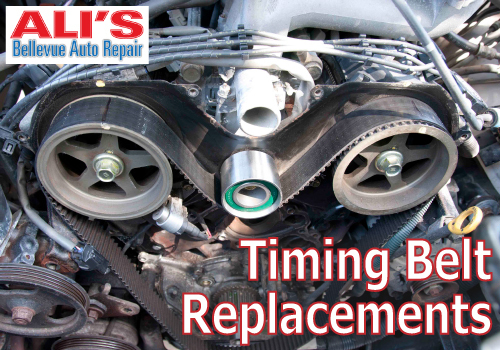 Ali's provides Timing Belt Replacement Bellevue WA drivers will be impressed with. We handle hundreds of these a year, and we will take care of you and your car with the utmost respect!